dressed up like a lady: More birthday love. Present #1: Click this link and see the new board MC created on Pinterest. I don't even think he meant to create it as a birthday present, but it sure feels like one. 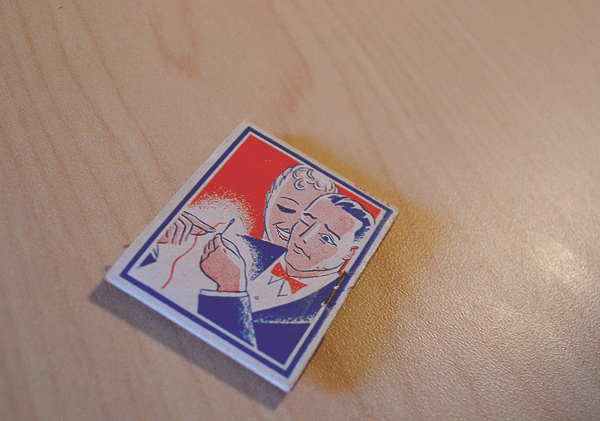 Present #2: He found this little 1930's sewing kit on Etsy, featuring a man and woman that look not unlike us. It's never been opened but I'm sure I couldn't bring myself to break the seal. It's just too precious! Present #3: Next was this set of vintage post cards featuring stunning and romantic Art Deco prints from one of my favorite artists of all time, Rockwell Kent. That little sewing kit is SEW you!! !